I am just about finished reading The Last Lecture by Randy Pauch. It has been an interesting read. The book was written as he was dying from cancer and wanted to leave some thoughts for his three children all under the age of six. 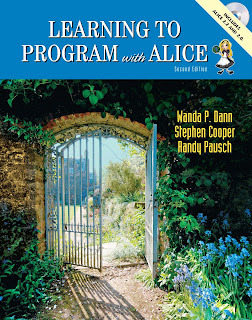 One thing I came across in the book is alice.org. When I read about alice I thought of my sister. So this post is for you babe! My sister is fourteen years old and is amazing at archery and wants to be in the olympics someday. She's already winning contests so she's on her way. She also loves to compose piano music. And she loves computers and programming. Hence the alice connection. So what is alice.org? It is a FREE educational software package that teaches computer programming in a 3D atmosphere. Why 3D? Because they wanted kids to enjoy it. Specifically they wanted teenage GIRLS to enjoy learning about computer programming. They found that girls didn't get into the game programming like boys did. So they invented a way to teach programing through storytelling. But it isn't just for girls. It's a revolution in computer science pedagogy. And it is available to anyone in middle school, high school, or college-with different levels for free. It is a free gift from Carnegie Mellon University and it was started by Randy Paush. It looks like he gets to keep living through his dream of teaching others to love what he did. If you've got kids, you'll want to check it out-you can start here to learn more about it. Have a fun learning Little Project!